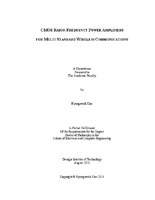 CMOS radio-frequency power amplifiers for multi-standard wireless communications - Download this document for free, or read online. Document in PDF available to download. The development of multi-standard wireless communication systems with low cost and high integration is continuously requested and accompanied by the explosive growth of the wireless communication market. Although CMOS technology can provide most building blocks in RF transceivers, the implementation of CMOS RF power amplifiers is still a challenging task. The objective of this research is to develop design techniques to implement fully-integrated multi-mode power amplifiers using CMOS technology. In this dissertation, a load modulation technique with tunable matching networks and a pre-distortion technique in a multi-stage PA are proposed to support multi-communication standards with a single PA. A fully-integrated dual-mode GSM-EDGE PA was designed and implemented in a 0.18 um CMOS technology to achieve high output power for the GSM application and high linearity for the EDGE application. With the suggested power amplifier design techniques, fully-integrated PAs have been successfully demonstrated in GSM and EDGE applications.In Addition to the proposed techniques, a body-switched cascode PA core is also proposed to utilize a single PA in multi-mode applications without hurting the performance. With the proposed techniques, a fully-integrated multi-mode PA has been implemented in a 0.18 um CMOS technology, and the power amplifier has been demonstrated successfully for GSM-EDGE-WCDMA applications.In conclusion, the research in this dissertation provides CMOS RF power amplifier solutions for multiple standards in mobile wireless communications with low cost and high integration.